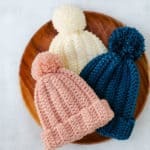 Support the #HatNotHat anti-bullying campaign with this free crochet plaid hat pattern in child, women and men’s sizing. The color changes become rhythmic after after the first few rounds and you’ll be left with only a couple of ends to weave in. Get the free pattern below or purchase the ad-free printable PDF for $2.99 here. 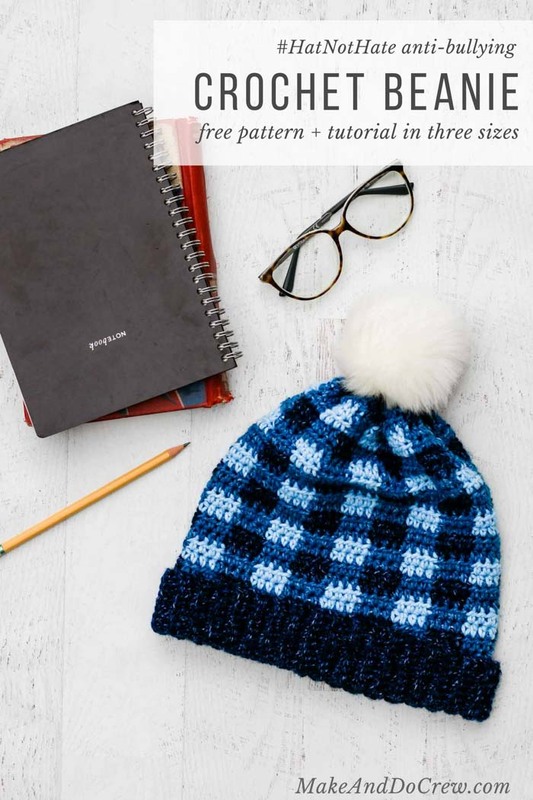 This free crochet plaid hat pattern is part of a collaboration with my friends at Lion Brand yarn. This post contains affiliate links. 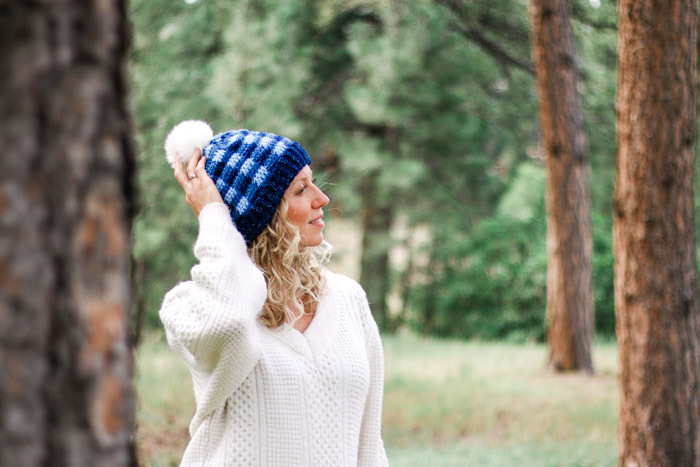 If you follow me on Instagram, you might have already gotten word of a fantastic new campaign Lion Brand is spearheading to show solidarity for anti-bullying by making, wearing and donating handmade blue hats. These hats will be worn on World Day of Bullying Prevention, October 1, 2018, and throughout all of October, which is National Bullying Prevention Awareness Month. Sometimes I can sit at home watching the news and feel a little helpless about the world I’ve brought my children into. All of us who have already traversed the rocky terrain of middle and high school know that it’s not necessarily an easy road for anyone. 1 in 4 children is the target of bullying though, and for those kids, the struggle is even more isolating. The #HatNotHate movement uses the official color of anti-bullying (blue!) to help bear witness to bullying and cyberbullying, show solidarity and promote inclusion. Read more about Hat Not Hat from on LionBrand.com here. 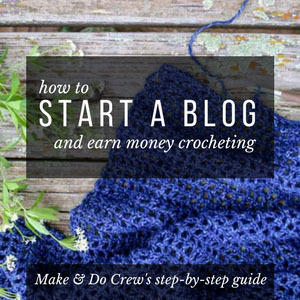 You can do what we crocheters do best–craft! This “craftivism” movement requires only a little bit of your time, creativity and yarn. 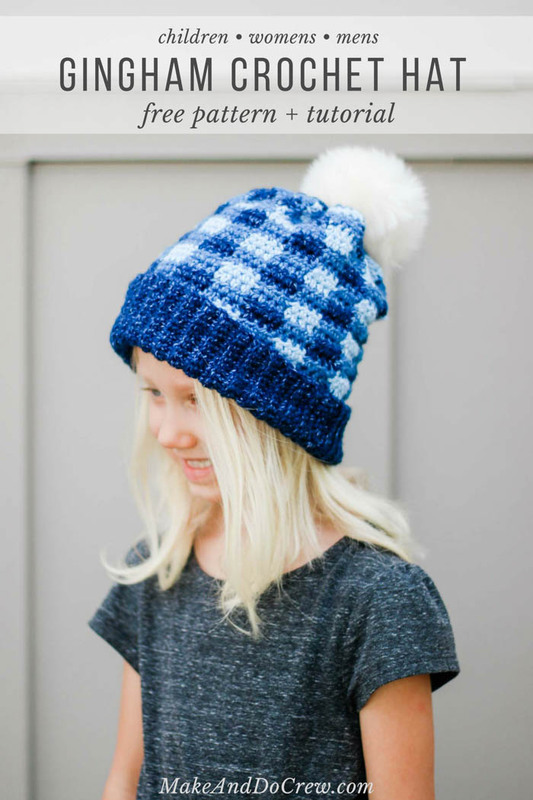 Make a blue hat for yourself, the kids in your life or to donate. Then share your hard work on social media with the hashtag #HatNotHate so we can all see what you’ve been up to! Lion Brand has also set an ambitious goal of donating 1,500 blue hats to a local school for World Day of Bullying Prevention. You can donate a hat (or many!) by sending it to the address below. Please note that the hats need to be received by September 24, 2018. What Hat Pattern Should I Use? Will a Crochet Plaid Hat Take Forever? But really, this crochet plaid hat took me a two evenings watching Netflix and left me with only a few ends to weave in. The beauty of color changes like this is that they require basically no thought, so you get in a rhythm and cruise. 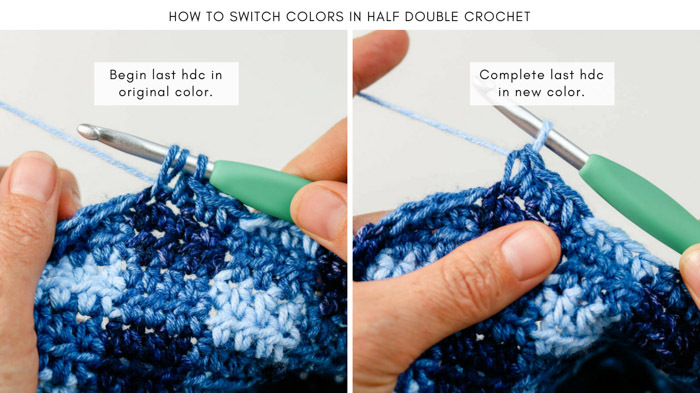 If you’re new to changing colors mid row/round, check out the photo tutorial below to learn the simple tricks. This video tutorial will also help. If you’re not hoping to make this pattern for the Hat Not Hate campaign, the color options are endless. To recreate this crochet plaid or gingham look in any color, simply use light, medium and dark yarn shade in the same color. For a crochet gingham look specifically, use a bright white for your light color. 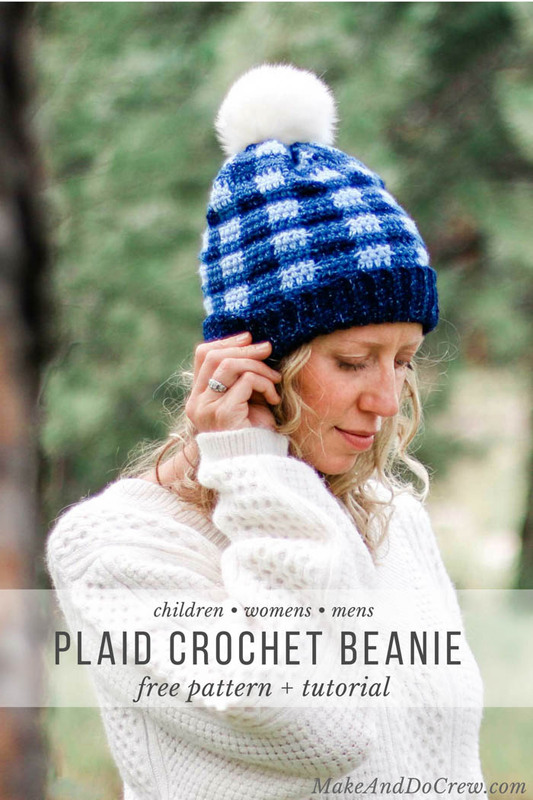 Okay, let’s crochet a plaid beanie! And don’t forget to share your hats on social media using the hashtag #HatNotHate so we can see your stitches! Sport a popular plaid look while also supporting the #HatNotHate anti-bullying campaign with this versatile crochet plaid beanie pattern written in three sizes. While the color changes might look intimidating, the technique becomes rhythmic after after the first few rounds and ensures you’ll be left with only a couple of ends to weave in. Follow the photo tutorials within the pattern and this video tutorial if you’re new to colorwork. 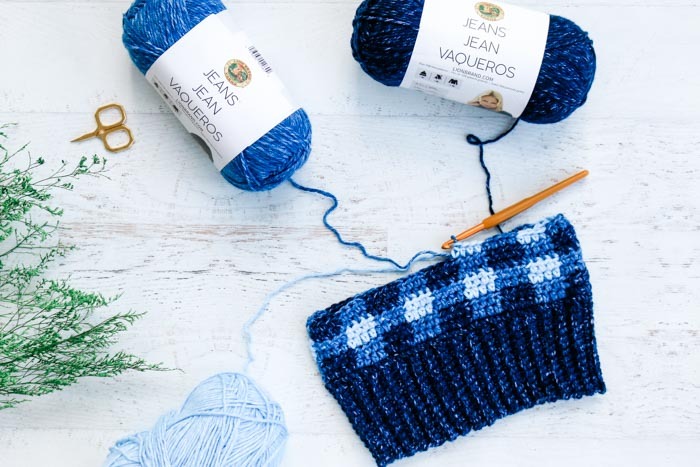 This basic crochet plaid stitch uses all half double crochet and can be easily modified to create a different plaid or gingham look by simply choosing a light (or white), medium and dark shade of the same color. • This pattern relies on keeping three colors of yarn attached at all times. To keep yarn from getting tangled, set two colors you’re working with in any given round off to one side of you and third color to the other side. At the end of the round, untwist the two colors if necessary before moving on to the next round. Whistle and Ivy shares a brief, very helpful video on keeping yarn organized while working here. • Unless you run into massive tangle trouble, there should be no need to cut yarn at end of round. • Ribbing is worked in rows and seamed at end. Using smaller hook and Dark yarn, ch 13 (15, 15). Row 2: Ch 1, scblo in each sc to end of row. Rep Row 2 62 (70, 78) more times for a total of 64 (72, 80) total rows. Fasten off leaving a 12” tail. Use tapestry needle and yarn tail to seam final row to Row 1, making sure ribbing strip is not twisted. 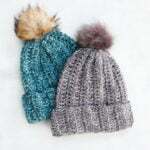 • After Foundation Round: hat is worked in turned rounds, which means you’ll slip stitch to initial turning chain to join a round and then turn your work similar to working in rows. • Ch 2 at beginning of each round never counts as a hdc. • See tutorial in photo below for details on how to seamlessly change colors if you’re unfamiliar. Pattern is written with the assumption that the skill of changing colors is already understood. • Do not cut yarn after changing colors. Instead crochet over “dormant” color with new color until next color change. See photo below. Using larger hook, attach Dark yarn at ribbing seam. Using Dark, ch 2, hdc in in next 4 sts, finishing final yo of last hdc with Medium. *Using Medium, hdc in next 4 sts, finishing final yo of last hdc with Dark. Using Dark, hdc in next 4 sts, finishing final yo of last hdc with Medium. Rep from * alternating 4 hdc of each Dark and Medium. End with 4 hdc in Medium. Using Medium, sl st to tch; turn. Using Medium, ch 2, hdc in in next 4 (Medium) hdc, finishing final yo of last hdc with Dark. *Using Dark, hdc in next 4 (Dark) hdc, finishing final yo of last hdc with Medium. Using Medium, hdc in next 4 (Medium) hdc, finishing final yo of last hdc with Dark. Rep from * alternating 4 hdc of each Dark and Medium. End with 4 hdc in Dark. Using Medium, ch 2, hdc in in next 4 (Dark) hdc, finishing final yo of last hdc with Light. *Using Light, hdc in next 4 (Medium) hdc, finishing final yo of last hdc with Medium. Using Medium, hdc in next 4 (Dark) hdc, finishing final yo of last hdc with Light. Rep from * alternating 4 hdc of each Medium and Light. End with 4 hdc in Light. Using Light, sl st to tch; turn. Using Light, ch 2, hdc in in next 4 (Light) hdc, finishing final yo of last hdc with Medium. *Using Medium, hdc in next 4 (Medium) hdc, finishing final yo of last hdc with Light. Using Light, hdc in next 4 (Light) hdc, finishing final yo of last hdc with Medium. Rep from * alternating 4 hdc of each Medium and Light. End with 4 hdc in Medium. Using Dark, sl st to tch; turn. Rep Rounds 1-4 3 (4, 5) times. There should now be a total of 16 (20, 24) rounds. 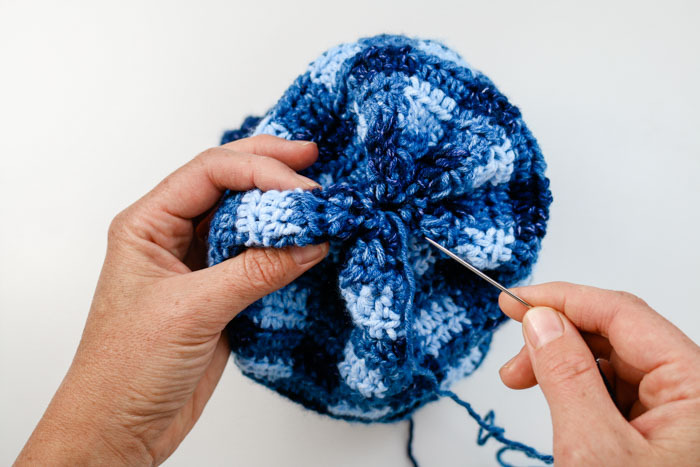 TIP: If a slouchier hat is desired, work one additional repeat of Rounds 1-4 to make hat taller before moving on to decrease rounds. Using Dark, ch 2, hdc2tog, hdc in next 2 hdc, finishing final yo of last hdc with Medium. *Using Medium, hdc2tog, hdc in next 2 hdc, finishing final yo of last hdc with Dark. Using Dark, hdc2tog, hdc in next 2 hdc, finishing final yo of last hdc with Medium. Rep from * alternating [hdc2tog, hdc in next 2 hdc] in Dark and Medium. End with [hdc2tog, hdc in next 2 hdc] in Medium. Using Medium, ch 2, hdc2tog, hdc in next 2 hdc, finishing final yo of last hdc with Dark. *Using Dark, hdc2tog, hdc in next 2 hdc, finishing final yo of last hdc with Medium. Using Medium, hdc2tog, hdc in next 2 hdc, finishing final yo of last hdc with Dark. Rep from * alternating [hdc2tog, hdc in next 2 hdc] in Dark and Medium. End with [hdc2tog, hdc in next 2 hdc] in Dark. Using Dark, sl st to tch. Fasten off leaving a 20” tail of Dark. Fasten off Light and Medium and weave in. Thread tapestry needle with Dark tail at top of hat. 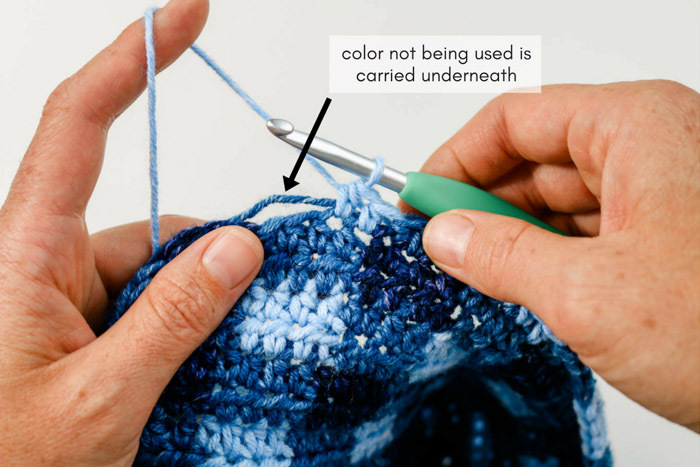 Use basting sewing stitch to pick up each crochet stitch in final round. Pull hat top closed and tie several knots. Do not fasten off. Use attached yarn and tapestry needle to attach fur or yarn pom pom. Find a tutorial on making a yarn pom pom here. I love to see your finished projects! Use #MakeAndDoCrew and #HatNotHate and tag me Instagram (@MakeAndDoCrew) to show off your stitches and have a chance to be featured. Two crochet designers I really admire have vast collections of free crochet plaid and gingham patterns on their blogs. 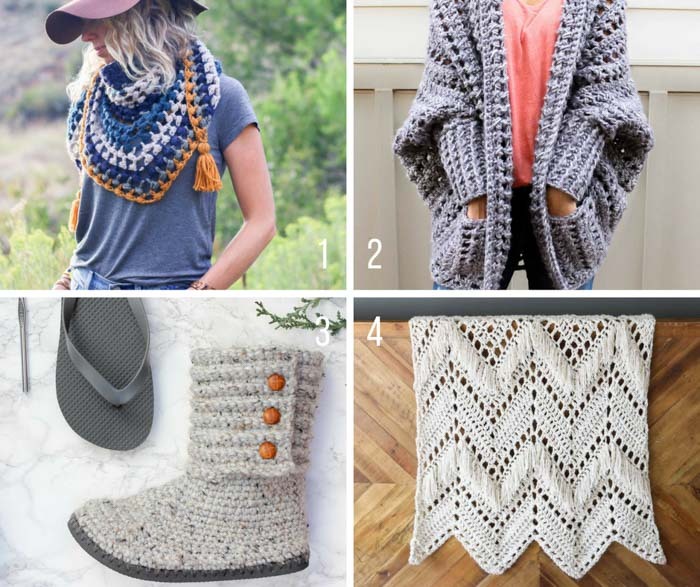 Check out Whistle and Ivy for all the crochet buffalo patterns you could ever want and Daisy Farm Crafts for charming crochet gingham afghans, baby blankets and more. SO PRETTY! I can’t wait to make this! I get tripped up on this from time to time and need some clarification. When you chain 2 which I know doesn’t count as a stitch, do you do your first hdc into the same stitch as the chain 2 or start your round in the stitch beside it? I get tripped up on this too! Seriously, every time I do hdc. Ha. That makes total sense! Thanks so much! !